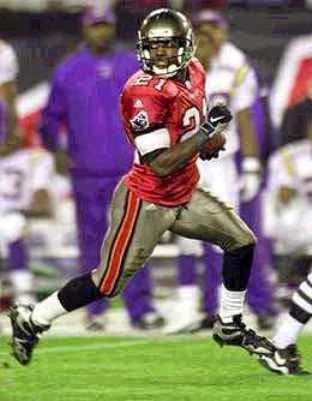 Abraham was chosen by the Buccaneers in the third round of the 1996 NFL draft and moved quickly into the starting lineup as a rookie, intercepting five passes and showing great savvy at the cornerback position. He intercepted another five passes in ’97 but, after starting 34 straight games, Abraham missed three with a knee injury in 1998. Buccaneers went 11-5 to finish first in the NFC Central while leading the NFL in fewest touchdowns allowed (19) and the conference in fewest total yards allowed (4280), fewest passing yards allowed (2873), and fewest points allowed (235). Won NFC Divisional playoff over Washington Redskins (14-13). Lost NFC Championship game to St. Louis Rams (11-6). Abraham followed up in 2000 with another seven interceptions and gained selection to the Pro Bowl. An excellent fit in Tampa Bay’s cover-two defensive scheme, he was capable on pass coverage and made up in technique and skill what he lacked in speed. Still, he lost his starting job to Brian Kelly in 2001 and was released after the season for salary cap reasons after having intercepted 31 passes in six years with the Bucs. He moved on to the New York Jets in 2002 and played well in a similar defense, but missed eight weeks in ’03 due to a shoulder injury. Following one last season with the Jets in 2004, Abraham retired. Overall, he intercepted 38 passes, returning them for 468 yards and three touchdowns, and was named to the Pro Bowl once.